A Southern Regional Police officer who was dragged about 125 feet by a car of fleeing suspects is back on duty, albeit light duty. Officer Michael Storeman suffered bumps, bruises and other injuries to his hips, legs and ankle during the Nov. 4 incident in Glen Rock. He was 40 years old at the time, Chief James Boddington has said. Storeman returned to work at the end of December and remains on light duty, according to senior deputy prosecutor Jonathan Blake. Both Storeman and Blake were at the Shrewsbury-area district judge office Tuesday afternoon for the scheduled preliminary hearings of David Achstetter and Jenny Kim, two of three people charged in the incident. 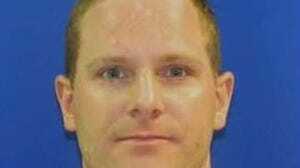 But after discussions between Blake and defense attorneys, Achstetter, 36, of Gaithersburg, Maryland, and Kim, 38, of Germantown, Maryland, waived their right to preliminary hearings. That means their cases have now been forwarded to York County Court for trial. The third co-defendant, Roberto Tabares Jr., 38, of Rockville, Maryland, waived his case to court on Jan. 12, court records state. All three remain in York County Prison in lieu of bail. Bail request: At Tuesday's proceeding, attorney Joseph Gothie asked presiding Senior District Judge Nancy Edie to reduce Achstetter's $250,000 bail. Gothie argued his client has no violent criminal history and has been locked up since Nov. 8. The attorney acknowledged Achstetter didn't surrender himself to police. "He went back to his home and stayed there," Gothie said. "He didn't turn himself in to police ... but very few people do." But Blake argued against lowering bail, saying Storeman was seriously injured. "This offense itself involves fleeing from police," Blake said, and Edie agreed. She declined to modify Achstetter's bail. 2nd bail reduced: Attorney Tom Kelley succeeded in convincing Common Pleas Judge Harry M. Ness to reduce Tabares' bail from a half-million dollars to $50,000, according to court records. Ness ordered the reduction on Feb. 23, records state. But Tabares likely can't be released even if he posts his reduced bail because authorities in Montgomery County, Md., have filed a detainer on him in a burglary case there, according to prison records. Tabares is scheduled to be in court April 13 for a pretrial conference. Edie set a date of April 8 for Achstetter's and Kim's formal court arraignment. Officer saw needle: Storeman was called to the CS Convenience Store at the corner of Main and Water streets shortly before 5 p.m. Nov. 4 for a report of a suspicious vehicle in the lot that had been parked there for some time, police have said. Charging documents indicate when Storeman approached the Toyota Camry he saw Kim in the back seat injecting herself in the arm with a syringe, and he believed that syringe contained heroin. The Camry's front passenger window was down, so Storeman tried to open the front passenger door, but the passenger — Achstetter, police allege — grabbed the officer's arm and held on, effectively pinning Storeman against the car, documents allege. That's when Tabares, who was behind the wheel, took off, speeding south on Water Street and dragging Storeman, who was repeatedly yelling at them to stop, according to police. Tabares drove into the opposing lane and went around two vehicles stopped for the stop sign at Water and Hanover streets, at which point Storeman's body struck the driver's side of one of the stopped vehicles, documents state. "Shortly after Officer Storeman struck the car ... he either was able to break free from the front passenger's grip or the front passenger released Officer Storeman's arm," documents state. At that point, he'd been dragged about 125 feet, police said. Fell, rolled: Storeman fell onto the road and rolled another 50 feet or so, police said. The chief has said Storeman hit the blacktop hard. The Camry kept going, but police later tracked down it and its occupants through the car's Maryland license plates, which were captured on the convenience store's security video, according to documents. "I think this is the worst injury I've seen to one of my officers," Boddington has said. "This could have ended up much worse." "It was Robert. Robert Tabares and his girlfriend Jenny. Jenny said to take off. They're crazy. ... I'm scared of them. I was scared, I swear." Charges against Achstetter and Tabares include aggravated assault, hindering the apprehension of a suspect and reckless endangerment. Kim is charged with conspiracy to commit those offenses. Achstetter also is charged with unlawful restraint, and Tabares is charged with fleeing police.